'More Personal Computing' unit, combining devices and software and services, serves critical strategic purpose. Microsoft has created a $43 billion business, a potential Apple-and-OEM-esque company-within-a-company that could be used to take up the slack if some of its computer-making partners falter—or much less likely, go independent if Redmond decided to spin off into parts. With last month’s reshuffling of how it reports financial results to Wall Street, Microsoft used pieces of six different groups to build three new segments: Intelligent Cloud, Productivity and Business Processes, and More Personal Computing. Intelligent Cloud is composed of the Windows server licensing business, enterprise services and Microsoft’s Azure cloud platform. Productivity and Business Processes, meanwhile, is based on the Office franchise—both consumer and commercial, both perpetual licensing as well as Office 365—along with the Dynamics CRM (customer relationship management) portfolio. More Personal Computing includes Windows, Bing search revenue and all of Microsoft’s own hardware, from Surface and smartphones to Xbox. 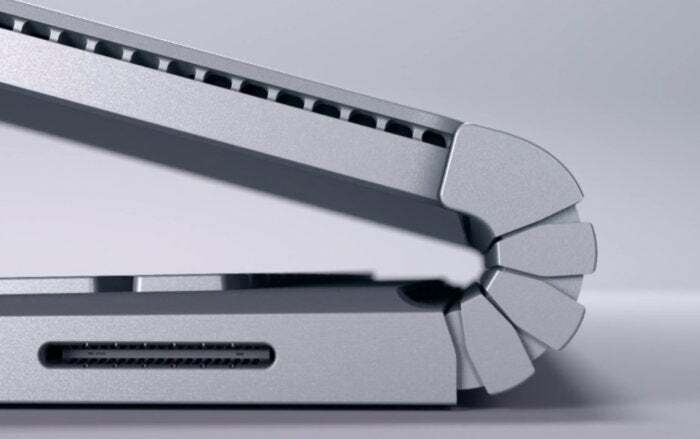 It’s the latter—More Personal Computing—that grabbed attention last week as its executives unveiled new Lumia smartphones, a fourth-generation Surface Pro, and most surprisingly, the Surface Book, Microsoft’s first laptop. Last month, Microsoft explained the changes to its reporting—those changes will be used for the first time on Oct. 22 during the September quarter’s earnings call—and gave financial analysts an idea of where revenue in previous periods would have appeared under the new regime. According to Microsoft, More Personal Computing would have booked $9.2 billion in revenue if the unit had been in place for the $22.2 billion June quarter. When expanded to include all of fiscal year 2015—which ended June 30—More Personal Computing would have recorded revenue of $43 billion of the total $93.6 billion. Microsoft’s ‘More Personal Computing’ segment is no OEM slouch: It beat Apple’s Mac business by 53%, Acer’s by 395%, in the second quarter. In other words, 42 percent of all second-quarter Microsoft revenue and 46 percent of all fiscal year 2015 revenue was generated by the pieces now included in More Personal Computing, making it the largest of the company’s three reporting segments. To put More Personal Computing’s revenue in perspective, Acer—the Taiwanese firm that was the fifth-largest OEM (original equipment manufacturer) last quarter by IDC’s count—posted revenue of $1.9 billion for the June quarter. Apple booked total revenue of $49.6 billion that quarter, but most of that came from the iPhone: The Mac, Apple’s personal computer, did $6 billion in business, or about 66% of Microsoft’s More Personal Computing. It’s More Personal Computing that best resembles the business model of Apple, for the former includes not only operating systems, gaming and search, but also hardware designed by Microsoft, made by Microsoft, to integrate software, services and hardware in ways that its OEM partners simply cannot. That’s Apple’s model, and it’s an extremely profitable one. 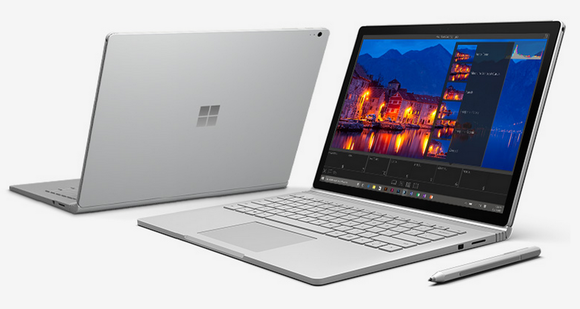 Microsoft positions its Surface Book as the "ultimate notebook". Microsoft made it clear that it sees its hardware line as competition for Apple in the premium-price sector. 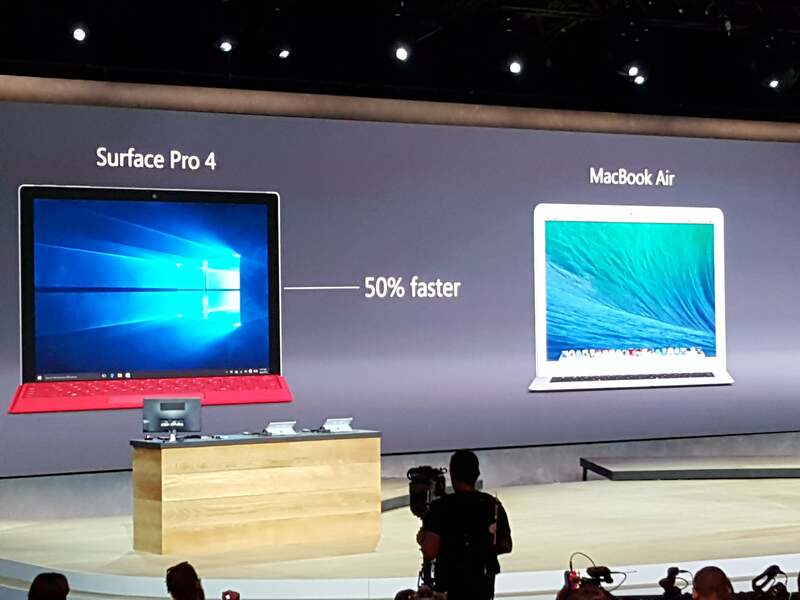 Surface and device chief Panos Panay called out the MacBook Air when he touted the Surface Pro 4—something he has done since 2012—but added the MacBook Pro, Apple’s top-tier laptop, when he contrasted it with the Surface Book. Apple’s strategy, and now Microsoft’s too, is to cater to the top end of the market where prices are highest, and virtually all profits are earned. While small in absolute volume—Apple shipped fewer than eight of every 100 personal computers in the latest quarter, IDC has said—premium vacuums up an overwhelming majority of the PC industry’s profits. The bulk of devices are now sold at razor-thin margins because OEMs have raced to the bottom to maintain unit shipment volumes, and thus “trained” most customers to expect low-priced hardware. Analysts, however, looked for more behind Microsoft’s hardware press, a strategy initiated by former CEO Steve Ballmer, seemingly dismissed by current chief executive Satya Nadella, but now one he has apparently embraced. Bajarin, who joined O’Donnell and Dawson on the Tech.pinions’ podcast, had an idea why Microsoft was pouring such effort into devices, especially the $1,500-and-up Surface Book. “In many ways, Microsoft is taking a stronger hardware position to be somewhat defensive, because if they start losing key partners, they have to do it themselves to continue to populate and propagate the Windows strategy that they have,” Bajarin said. Bajarin had expanded on that concept in an analysis posted to Tech.pinions Friday. Of the top three Windows OEMs—Lenovo, HP and Dell as ranked by both IDC and Gartner for the September quarter—only HP has much interest in the consumer PC market, argued Bajarin. “Should HP flounder in their PC business, that could have a major impact on Microsoft—HP may not be able to deliver the volume shipments of PCs that would help drive their Windows franchise to a broader consumer audience,” he wrote. 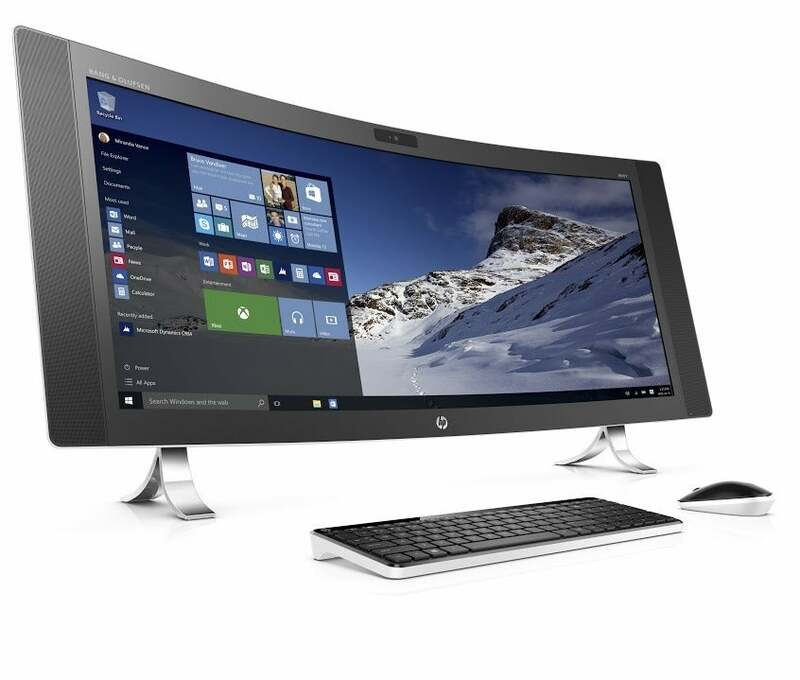 The latest HP Envy is designed to incite...envy with its large, curved screen. Bajarin’s argument rested on that assumption: That the number of Windows OEMs would shrink; that those who remain would lose interest in the cut-throat consumer business; and that Microsoft might have to intercede with its own hardware division, ramping up choices and sales to keep Windows in front of consumers. “What Microsoft is doing is learning how to create great hardware, which will serve as a potential back-up strategy for them should more of their OEM partners flounder,” Bajarin said, adding that the Surface was more than a mere reference and/or flagship labor, but one that was “very strategic” to the Redmond, Wash. firm. O’Donnell agreed. “If Microsoft does pick up all the slack from all the smaller guys, then that becomes a very interesting, and probably very realistic, scenario,” he opined during the podcast. More Personal Computing could also be the foundation of a spin-off, a move that has surfaced—no pun intended—from time to time, from both industry and financial analysts. For example, Ben Thompson, an independent analyst who operates Stratechery.com, has suggested that it would be in Microsoft’s best interest if it spun off Windows and hardware. Thompson’s premise: That Microsoft’s historical blueprint was to champion Windows at the expense of its other businesses, primarily Office (the so-called Windows strategy tax). Although Nadella has backed away from that mindset—starting with the 2014 debut of Office on iOS, facilitated by the growth of its cloud operations—Thompson has interpreted some of the company’s recent comments as showing signs of reverting to the Windows-first mentality. If it came to that, More Personal Computing is positioned to be that independent entity, not only because it’s been segregated from the rest of Microsoft’s revenue by reporting segment, but also because it has, for the first time, an executive in charge of both Windows and all devices, from smartphones to tablets to laptops, in Terry Myerson. “What made [last week’s Surface event] exciting and the various devices compelling ... was the fact Windows is fighting for itself: It is making devices not for show but for actual profit, and that makes all the different in the world,” said Thompson. This story, "Microsoft's 'More Personal Computing' is the next major hardware company" was originally published by Computerworld.